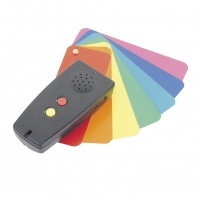 This pocket-sized 2-in-1 unit is the ideal Color Identifier/Light Detector for the blind and colorblind. Discerns and clearly announces the exact color shade in Spanish. Distinguishes up to 150 shades over the entire color spectrum - not just red, for example, but pale red, light red, dark red, as well as intense red. Also detects the presence of light and indicates intensity and proximity by audio signal. Volume control. Earphone jack for private listening (Earphone not included.) Unit measures: 4-3/8 x 2. Uses 2 AAA batteries (included.) Includes zippered carrying case. One-year limited manufacturer's warranty. 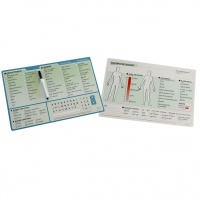 Large, easy-to-read text communication board; Word Boards offer an "I Am" column to indicate state of being; An "I Want" column to indicate wants and needs; Pictures of the body to indicate needs in a certain area; Color-coded pain intensity levels from 0-10 to describe listed discomforts; Dry-erase construction with dry-erase marker included. Spanish version. Advanced magnetoresistive compass technology. In the vast Australian bush, orientation is vital. No wonder the world's first talking compass is Australian. 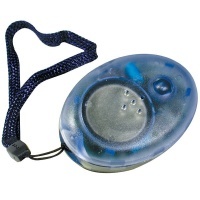 Use it in the car (no more wrong turns), in the bush, anywhere. No moving parts. Multilingual capability. Supplementary color display, of 8 points for noisy conditions or the hard of hearing. Powered by two 12 V batteries (not included). 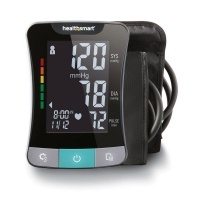 HealthSmart Talking Upper Arm Blood Pressure Monitor announces your blood pressure (in English or Spanish) and is ideal for low vision with easy-to-read results on a large, backlit LCD. This lovely Ladies Gold-Tone Spanish Talking Watch - One Button Expansion Band has a female voice that speaks the time in Spanish. This talking watch has a full inch in diameter face, so individuals who have a hard time seeing and reading smaller watches can do so without strain. 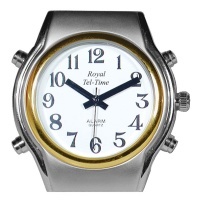 The Ladies Gold-Tone Spanish Talking Watch - One Button Expansion Band features a white face with bold black hands and numbers. Time announcement is in 12-hour (am/pm) format. There is a rich high-gloss mirror-like Gold-Toneen finish on expansion band and casing. Requires two batteries; included and installed. The only Classic Ladies Bi-Color Spanish Talking Watch that has time and alarm announcement with clear female voice. Bi-Color Case Matte Finish w/White Dial and 1-12 Black Numbers-Black Leather Band w Silver Buckle. Features: hourly audio annoucement and alarm with 3 different sounds. Easy to maintain. Powered by 2 lithium batteries (included). Dial size 1 1/4 Diameter. 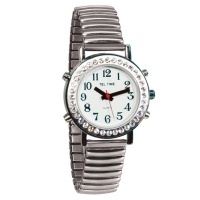 The only Classic Ladies Bi-Color Spanish Talking Watch that has time and alarm announcement with clear female voice. Bi-Color Case Matte Finish w/White Dial and 1-12 Black Numbers- Bi-color Expansion Band. Features: hourly audio annoucement and alarm with 3 different sounds. Easy to maintain. Powered by 2 lithium batteries (included). Dial size 1 1/4 Diameter. The only Elegant Ladies B-Color Spanish Talking Watch that has time, alarm, calendar, timer annoucement with clear female voice. 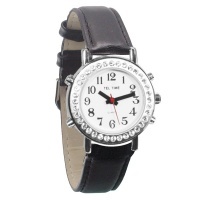 Bi-Color Case Polished Finish w/ White Dial and 1-12 Black Numbers-Black Leather Band w/ silver buckle. Easy to set, easy to maintain. Powered by 2 lithium batteries (included). Dial size: 1 1/4 Diameter. The only Classic Ladies Bi-Color One Button Spanish Talking Watch that has time announcement only without alarm clear female voice. Bi-Color Case Matte Finish w/White Dial and 1-12 Black Numbers- Bi-color Expansion Band. Easy to maintain. Powered by 2 lithium batteries (included). Dial size 1 1/4 Diameter.